Our wholesale department offers a wide range of building and finishing materials made by recognized domestic and foreign manufacturers. In our warehouse foundation blocks, insulation and thermal insulation materials, everything from floors to roof systems can be purchased. Our offer also includes assortments associated with landscaping, such as fences, pavements and garden watering equipment. We respect our customers time offering a wide range of building and finishing materials in one place, assisting with calculation of the product and advising our customers on a solid and trustworthy contractor. 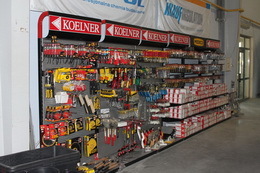 Our wholesale offer also includes finishing materials, plasters, gypsum, plasterboard, flooring, windows, doors, paint, tools and accessories, toilets, fittings, garden watering systems. We fulfill individual orders of goods in a short time, all for a complete satisfaction of our customers. We do wholesale as well as retail. Our customers are wholesalers: manufacturing, contracting companies and individual clients. We approach each customer individually. Our warehouse provides each of our customers with professional services based on their needs and capabilities. We will help choose the best offer. Among many companies existing in the construction market, we selected those that offer the highest quality at a reasonable price. For regular customers and customers who make major purchases we offer very attractive prices. 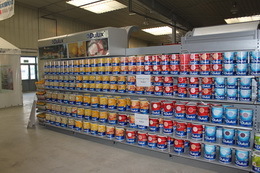 We have mixers of plaster and paint. The selected color is mixed „on the spot”. Our wholesale customers do not have to worry about transportation and unloading of purchased goods, because we provide our own transportation. In the area of ​​Tomaszów Mazowiecki transportation is FREE of charge.